This project is egg-celent!! 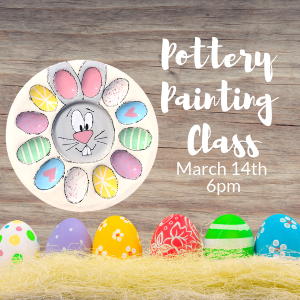 Join us for our next pottery painting class where we will be painting egg plates with a fun Easter Bunny design. This class is instructor led, but also allows you to go at your own pace. Feel free to change colors/design to meet your wishes. Grab a friend and make plans to come paint with us! Bring your own beverage and snacks! Class reservation includes egg plate, paints, supplies and a helping hand.